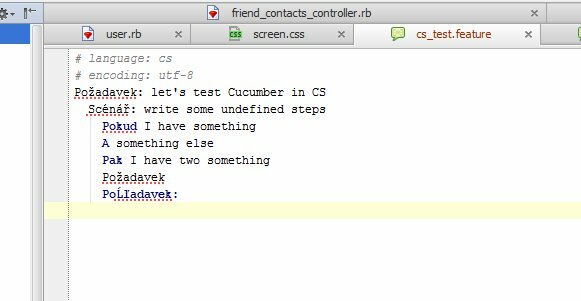 I wrote Rails app with some cucumber scenarios in Czech language ( #language: cs). They all pass. 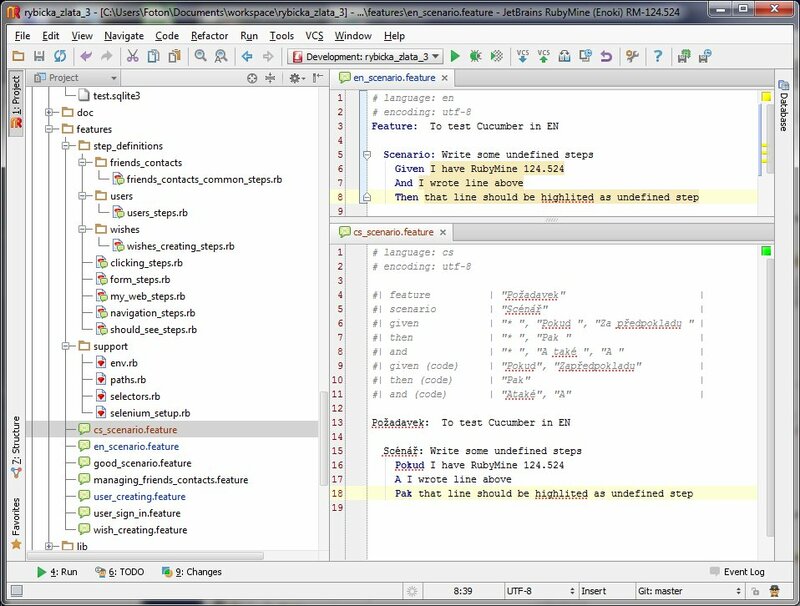 But when editing them in RubyMine 4.5.4, there is no highliting or code completion. On attached image ther is english and czech scenario. English have highliting, code copletion and recognized undefined step. Czech have only typo errors. Attaching the project settings screen too. just installed windows version "RubyMine (Enoki) RM-124.524". RM now highlite SOME keywords, but not all. Code completion does not work (tried word "Pokud", which is highlited, as "pok"+ <CTRL+SPACE> => "no suggestion"). Highlite of undefined step do not work too. If I use ENG, everything work as expected. See screenshot. I've attached similar scenario which works fine for me. Does it works for you? Could you please attach your version of .feature file which doesn't work. 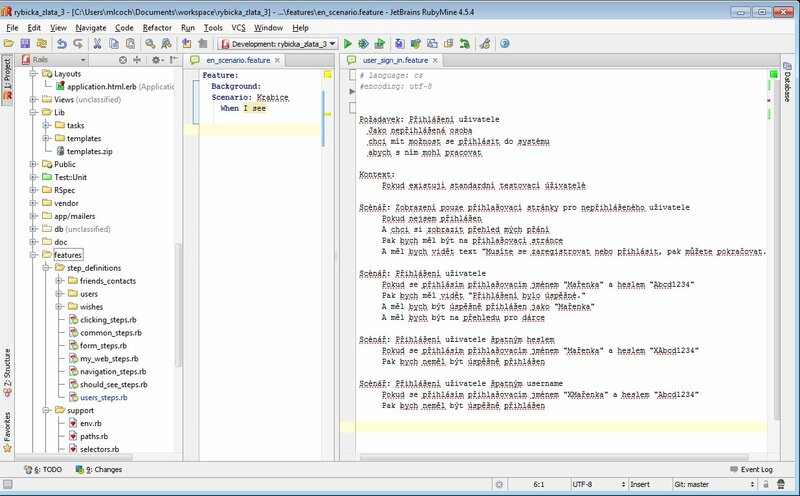 It do not highlite "Požadavek" and "Scénář"
When I first try code completion on "Po" under last line ("Pak I have two something") then there are suggestions "Požadavek", "Pokud". When I then try on new line completion for "Po" it writes "PoĹľadavek:" (letter"ž" is somehow scrambled) immediately, no menu to select from. When I then try on new line completion for only "P" it writes "PoĹľadavek:" again immediately, no menu to select from (should be "Požadavek", "Pokud", "Pak"). I done it on fresh new project and instalation of RM without transfering settings to RM 4.5.4 . What OS version are you using and what are locale settings? Rails locale is set to: I18n.default_locale = "cs"
to it and see if this will help with the problem. Yes, this one do that trick. 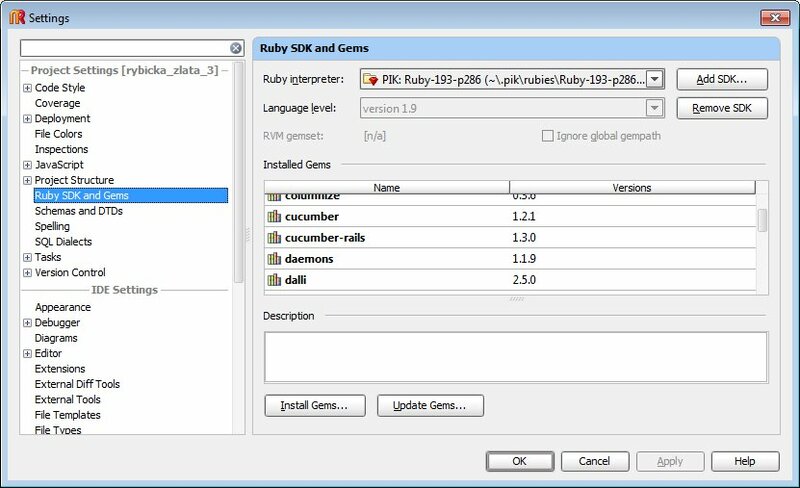 RM 5 + adding line "-Dfile.encoding=UTF-8" to ..\RubyMine124.524\bin\rubymine.exe.vmoptions . Highliting, code suggestion and creating of undefined steps, everything now work. this means we have one more bug :( could you plaese file a ticket about this (so, you would get notification when the problem will be fixed).